The busier our lives get, the harder it is to make meals that are more elaborate than a grilled cheese or cereal. If food is one of the greater joys in your life, then you probably don’t want to skimp on making exquisite dishes. Of course, you also can’t sit in front of the stove for two hours getting all the preparations in order or stirring sauces as there’s more work, chores, or errands that need to be run. While we will eventually be able to print out delicious meals in full, for now we have to settle for devices that help expedite the cooking process. This 3 Squares SOUP3RB Blender is sure to take some of the burden of cooking off of your shoulders. It can blend, pulverize, puree, and liquify, sure, but it can also cook soup, saute veggies, and brown meat. Let’s see any other blender try that. The idea behind this is to cut down on menial steps and remove you from most of the process. Since this can handle cold as well as heat up for hot food items, you can make just about anything without having to constantly monitor it. 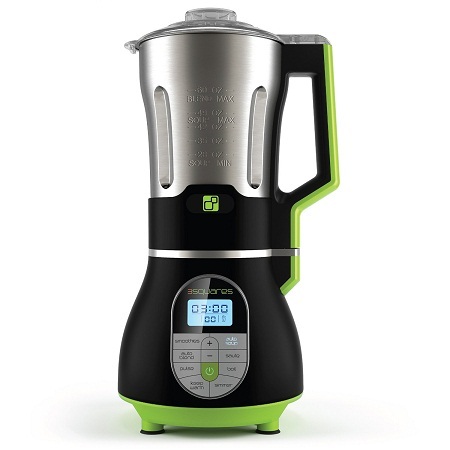 This uses a 7-cup detachable stainless steel blending pitcher which will take care of the grunt work, but you won’t have the satisfaction of having a see-through blender and watching all the ingredients combine. This is going to cost you around $70, and will be the beginning of a beautiful expanded menu.